Robert “Bob” W. Nible, age 89, of a former long-time resident of Norwalk, passed away Thursday evening, November 29, 2018 at the Unity Point - Iowa Methodist Hospital in Des Moines. A visitation with Bob's family and friends will be 2:30 to 4:30 p.m. on Saturday, December 8th at O'Leary Funeral Services in Norwalk. Memorials in Bob's name, to be designated by the family later, will be accepted. To send a condolence and flowers please click the send tributes/flowers tab on this screen or call O'Leary's Flowers at 515-981-0700. Robert Wesley, the son of Charles Wesley and Laura Gertrude (Oswalt) Nible, was born on June 29, 1929 in Beloit, KS. The oldest child and only boy; Bob moved with his family to Ridgeway, MO and later to Norwalk, IA when he was a young teenager. When in school he enjoyed working at his dad’s business Norwalk Auto and racing stock cars. He graduated from Norwalk High School with the Class of 1947. Following school, he met his sweetheart, Virginia Mae Kochheiser, and drove a delivery truck for her father. They were married January 12, 1951 at the First Open Bible Church in Des Moines. To this union they had four children, Sandi, Wes, Jeane, and James. In 1951, Bob served his country honorably in the U.S. Army during the Korean Conflict. He was stationed overseas, along with his wife at the Army Base in Manheim, Germany. Bob worked as a gun mechanic, specializing on the repair of the guidance and radar systems, while his Virginia was a secretary on the base. They returned to Norwalk where he worked as the U.S. Postmaster in Norwalk. Bob and Virginia started the company, Contract Transport in Norwalk and later moved to Des Moines. They specialized in highway contracting for the U.S. Postal Service. Initially, Virginia, his dad and father-in-law drove the trucks while Bob continued to work at his other full-time jobs. Bob and Virginia retired in 1989 and moved their home to Arizona living in Green Valley and later Tucson. Since this time, they spent their winters in Arizona and then travelled to Iowa, living in their motor home during the summer. Bob was a string musician playing the banjo, slide guitar, acoustic and electric six string guitar and upright doghouse bass. 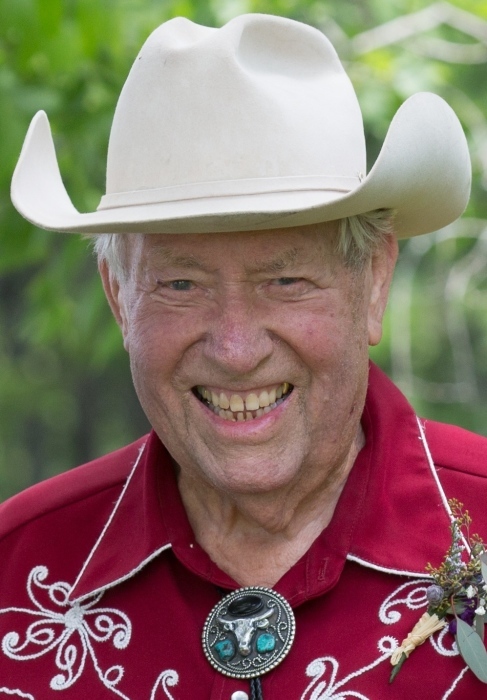 He enjoyed playing Western Swing and Blue Grass music the most and was a member of the Warren County String Ticklers. Virginia was his biggest fan, she would make pies and cookies for the members of the band and often traveled in their RV to events. In Tucson, he was a member of the Fun Band, he also enjoyed just playing for fun and sometimes at church too. In his later years, he would play at retirement and nursing homes. He enjoyed sharing and teaching his gift of music to everyone. He was a member of the Mercedes Club and a former member of the Norwalk United Methodist Church. Bob always wore his cowboy hat and boots regardless of where he was, often embarrassing his kids with his unique dress attire. Bob passed away peacefully after sharing time with his family on Thursday, November 29, 2018. He lived 89 years and 5 months. He was preceded in death by his parents; and a sister, Charlene Riggs. He is survived by his wife, Virginia; his four children, Sandi (Allen) Bergman of Dallas Center, Wes Nible of Altoona, Jeane Nible of Des Moines, and Jim (Judy Broxmeyer) Nible of Van Meter; several grandchildren and great-grandchildren; a sister, Laura Anne Hopkins of Des Moines; and a host of other family and good friends.